A Value is a principle that guides our thinking and our behaviour. At Holly Park, every individual is valued for who they are and what they contribute to the school. Values are intended to support the personal, social and spiritual development of every pupil throughout the school. The whole staff team, parents and pupils are involved in promoting values and recognising where others are ‘living the values’. The values developed have been selected after consultation with pupils, staff, governors and parents as values which are important within the school community and which will be important throughout life. Thank you to everyone (parents, staff and governors) who filled in the values survey last term. Children also completed homework about values. It has become very clear which values are important to our Holly Park community and we have already begun to introduce the 22 Holly Park Values. There will be 11 values each academic year (one per month) over a two year cycle. Improve behaviour, conduct and self confidence by developing strong values within the pupils at the school. Develop pupils understanding of what values are and why they are important in life. Encourage children to ‘live the values’ in all aspects of their lives both in school and out. Promote values to pupils in every aspect of school life. 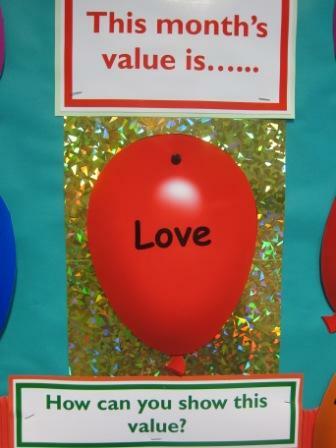 Display our school values and encourage all visitors to take account of them in their time in the school. Encourage parents to support the programme at home by promoting the ‘value of the month’ to parents in newsletters and in the entrance foyer. Enable children to focus upon the positive aspects of themselves that they can value, thereby reminding them of their individual worth, their worth in the school and wider communities and the worth of those communities themselves. At Holly Park, we recognise that during recent years a great deal of national and local effort has been rightly directed towards school improvement and curriculum development. However we also believe that Values Education has a crucial role in education, because it plays a part in raising achievement and it encourages pupils to be emotionally intelligent, articulate learners. Values supports quality teaching and learning, whilst making a positive contribution to the development of a fair, just and civil society. These values are the basis for the social, intellectual, emotional, spiritual and moral development of the child. We encourage pupils to consider these values, thereby developing knowledge, skills and attitudes that enable them to develop as reflective learners and grow to be stable, educated and emotionally intelligent civilised adults. Our value for March is responsibility. This means the obligation to behave well, having a duty to fulfil. In school this may be shown as: making good decisions about our own behaviour, taking responsibility for our learning, being independent, bringing the correct equipment and PE kit to school, handing homework in on time, caring for others. Responsibility also includes thinking about being a good citizen and caring for our environment. Talk to your children about responsibility. The value of the month is ‘Empathy.’ Emotion researchers generally define empathy as the ability to sense other people’s emotions, coupled with the ability to imagine what someone else might be thinking or feeling. It is the ability to understand another person’s perspective or circumstance whether you agree with this person or not. Empathy is a useful skill to develop in children. This month our value is ‘Integrity.’ The fundamentals of integrity are: Responsibility, Respect, Fairness, Trustworthiness and Honesty. A child can demonstrate integrity when they uphold honesty and differentiate between what is right and wrong. Integrity means following your moral convictions and doing the right thing in all circumstances, even if no one is watching. A person with integrity is truthful, honest, caring and genuine, dependable and worthy of trust and respect. Integrity takes a stand for what’s right – even when it’s not popular. Integrity has a strong sense of self. Integrity respects others, their beliefs and their skills. Integrity lends a helping hand. Loyalty is about belonging. Loyalty for our pupils is about belonging to a football team, Holly Park, family, friends etc. Loyalty is a strong feeling of support or allegiance, faithfulness, trust, commitment etc. This is very pertinent as we approach the 100 year anniversary of the end of WW1 – how the soldiers in WW1 and WW2 were very loyal to their country and fought for it. Over the month of November, the children will talk more about loyalty. Acceptance means to accept our differences. It means showing respect for the race, religion, age, gender, opinions, and ideologies of other people or groups. One of the Fundamental British Values to be taught in schools is about tolerance – a fair, and objective, attitude to those whose faith and beliefs may differ from one’s own. At Holly Park we do not believe that a diversity of faiths and beliefs is something to be tolerated but rather accepted and celebrated. As a school we are emboldened and strengthened by our diversity. We promote the importance of learning and working together with those with different faiths and beliefs. Being courageous can mean different things to different people. For example, one person may find it easy to speak in front of a large audience, whilst another would need to find lots of courage to do this. Everyone faces challenges from time to time, and we have to find courage to overcome them. Talk with your child about the different challenges each family member might face. Talk about who or what helps us to find courage. Share with your child someone you admire because of the courage that they have shown. Determination means – not giving up when things get difficult. Determination is being able to do or achieve something. It is about making your mind up about something and driving on to achieve a goal. Being prepared to make mistakes and persevere to get things right and learn from the mistake. I hope that our Year 6 children will show lots of determination next week during their national test week. You might like to think about some of these sentiments or quotes with your children at home. – Honest people: tell the truth despite consequences, voice their opinions in a kind, thoughtful way. “Honesty is the best policy. If I lose mine honour, I lose myself.” William Shakespeare. “To make your children capable of honesty is the beginning of education.” John Ruskin. ‘To be honest with others, you must first be honest with yourself.’ Anon. This month our value is Love. Holly Park children love learning! The Holly Park staff create engaging and creative learning opportunities which encourage your children to be excited about their learning. ‘Keep love in your heart. A life without it is like a sunless garden when the flowers are dead.’ Oscar Wilde. The value for the start of 2018 is ‘hope.’ This value is more than just wishing for things to be different, it is about believing that things either in our own personal world or the wider world can be better and being prepared to do something. At this time of year individuals and families often make New Year resolutions. As a family you might talk about your hopes and dreams for the future and what you can do to make them happen. Albert Einstein said ‘Learn from yesterday, live for today, hope for tomorrow.’ In our assemblies we will be looking at what hope is, hopes related to our Rights and hopes for world peace. The Value for December is ‘Generosity.’ In assembly we spoke to the children about what it means and about the different types of generosity. We talked about being generous with our actions, our words, our time, with money and about generosity of spirit. We talked about the festive period not being just about receiving but about giving too. At Holly Park I think we demonstrate generosity to our children in many ways. The Holly Park families have shown lots of generosity this term with Harvest and charity donations. We want our children to have an understanding of and respect for the rights, equality and diversity of all without discrimination. We believe it is important to equip children with the skills, attitudes and behaviours needed to develop mutual understanding and respect, empathy, trust and honesty and acceptance. We want our children to become confident, fair and responsible individuals who make informed and responsible decisions throughout their lives. The theme of Equality also links with Diversity. At Holly Park we are a very diverse school. It is that diversity that makes Holly Park an interesting place to come to each day. Equality also follows on from last month when we participated in’ Black History Month’ Later in November we will participate as normal in Anti- Bullying Week and this also links with Equality particularly as the theme is ‘All different, all equal.’ During November we will be talking to the children about bullying and cyber bullying. Although we have very few incidents of actual bullying it is important for all the children to be aware of what bullying is and how to deal with it. No child deserves to be bullied – it is unacceptable behaviour. Our Value for October is ‘Friendship.’ This value is explored constantly in all areas of school life. Children (and adults) are at their happiest and most confident when amongst friends. Unhappy times at school are usually as a result of children having minor ‘fall outs’ or disagreements with each other. Staff are sensitive in dealing with these issues and children are very clear about what makes a good friend. Friendship can mean different things to different people and we look forward to learning from each other during the month of October. We will be reflecting on and valuing the friendships we already have. We will also talk about making new friends. Friends come in all shapes and sizes. Some are older, some are younger, some are always there, some we only see occasionally. What makes a good friend? How do we choose our friends? Are we a good friend to others? Questions we can all ask ourselves – whatever our age! For me, Holly Park is a great place for friendship and I hope that all of the staff, parents and children will find friendship here. Friendship plays a very important part in our lives. why it is important to be able to trust others when working together as a team “Trusting someone is like knowing you can jump and they will be there to catch you” Anon Trust is a particularly good value for our Y6 children to work on as they move on to secondary school and mature into teenagers. The value for May is Co-operation. Please find some time to talk at home about what it means to co-operate with each other! Working together to get something done. Talking and agreeing how to do something. Being helpful and doing your bit to sort something out. Children need to think about how they need to co-operate and work together as a team to achieve goals. Co-operation is – teamwork, interacting and joining in, Listening and respecting each other, Lending each other a helping hand, Working together, Trust and support, Helping one another, Not letting other people down, Sharing each other’s ideas, Compromise, Communicating with each other, Responsibility to others. “Wait your turn.” “Wait ’til you’re bigger.” We often ask children to be patient, but developing this value takes time. Patience is the ability to endure a difficult situation without complaining. It means showing self-control and staying calm in the face of frustration or boredom. When you’re patient, you understand that some things are worth waiting for. But patience isn’t only passive waiting–it means persevering when things get tough. Adults as well as children often get frustrated if they don’t see immediate results. But at any age it’s important to wait for the right time to speak or act. Patience is a value which can have a hugely positive effect on ourselves and those around us. Our value for March is responsibility. This means the obligation to behave well, having a duty to fulfil, In school this may be shown as: making good decisions about our own behaviour, taking responsibility for our learning, being independent, bringing the correct equipment and PE kit to school, handing homework in on time, caring for others. Responsibility also includes thinking about being a good citizen and caring for our environment. Talk to your children about responsibility. This month our value is ‘Integrity.’ The five fundamental values of integrity are: Responsibility, Respect, Fairness, Trustworthiness and Honesty. A child can demonstrate integrity when they uphold honesty and differentiate between what is right and wrong. Integrity means following your moral convictions and doing the right thing in all circumstances, even if no one is watching. A person with integrity is truthful, honest, caring and genuine, dependable and worthy of trust and respect. Generally, the children at Holly Park are wonderful at being kind to each other, to visitors and to outsiders. Daily we witness acts of kindness by our children and we reward them for it. Christmas is a great time of year to think about kindness and compassion towards each other. Please talk to your children about what kindness means and how being unkind to others is very hurtful. As we draw to the end of the Autumn term, children are tired and over excited and need constant reminders about doing the right thing and behaving in the right way towards each other both at home and at school. Showing kindness to each other is a very important value and we as adults are the best role models our children have. In assembly we talked about loyalty and what it means. We talked about loyalty to football teams, Holly Park, family, friends etc. We talked about what loyalty means. We discussed how it is a strong feeling of support or allegiance, faithfulness, trust, commitment etc. We talked about how the soldiers in WW1 and WW2 were very loyal to their country and fought for it. Over the month of November, the children will talk more about loyalty. Acceptance means to accept our differences. It means showing respect for the race, religion, age, gender, opinions, and ideologies of other people or groups. One of the Fundamental British Values to be taught in schools is about tolerance – a fair, and objective, attitude to those whose faith and beliefs may differ from one’s own. ‘We are all born in a different way, how we look and what we say. From different countries around the world, of different genders: boys and girls. Of many sizes and colours too, the things we like and the things we do. We’re sure glad it works this way, the world is so colourful every day. In September our value is Fairness. Fairness is: Treating all people with honesty and respect, giving everyone equal opportunities to succeed and making sure others are not treated badly. It is important to be fair in order to make sure that everyone has the chance to succeed. Some people who have fought for fairness are – Martin Luther King, Rosa Parks and Abraham Lincoln. Standing up for someone who is being treated unfairly. Polite people think about what they say and aim not to be rude. When you are polite you show appreciation to others in your manners, the words you use and how you behave. Showing someone you appreciate something they have done for you by saying thank you. Saying please when you have requested something. Doing things to help without being asked. Waiting for your turn when waiting to speak and in actions. Holding the door open for others and letting others go before you. Please remind your children about being polite to others – at home and at school! Being courageous can mean different things to different people. For example, one person may find it easy to speak in front of a large audience, whilst another would need to find lots of courage to do this. Never giving up, setting goals and working towards them, asking for help, not being afraid to make a mistake. Being prepared to struggle on when things go wrong. Being prepared to make mistakes and persevere to get things right and learn from the mistake. This month we are thinking about Excellence. We talked about it in assembly and some of the teachers gave excellent definitions and talked about what they would like to see and how children can excel. This is particularly important for our Y6 who will soon be sitting their National Assessments. Excellence is also an Olympic value. Excellence is about how to give your best, on the field of play or in school. Excellence is about taking part and making progress, not about how good you are at the start. In assembly we have been hearing stories about the importance of being honest. As always, we will be thinking about this value when discussing friendships, behaviour and in our learning overall. You might like to talk to them about Aung San Suu Kyi from Burma who refused to be silent about the truth that was happening in her country and who was awarded the Nobel Peace Prize whilst under house arrest. On her release thousands thanked her for standing up for the truth and helping to bring about change in Burma. This month our value is love. Holly Park children love learning! The Holly Park staff create lively and creative learning opportunities which encourage your children to be excited about their learning. In our initial assembly we thought about what love might look like – friendship, compassion, trust, kindness etc. We thought about signs of love all around us and who in our lives shows us love. We talked about how love comes from within. We reflected on what we loved about ourselves. We thought about love of the environment – and loving where we live. We considered what a world without love would look like.